Used 2014 Volkl RTM 81 Expert Ski with Marker RTM Binding 171cm C. Marker RTM Wideride Demo Adjustable Binding (DIN 4-12). This is a 2014 Used Volkl RTM (Ride The Mountain) 81 ski with Marker RTM demo bindings (DIN 4-12) that adjust from adult boot size 5-13 so you won't have to redrill your skis. The Volkl RTM 81 blends the technologies between the two most popular RTM models- RTM 84 and RTM 80. Made for the advanced to expert skier, the 81 has the XTD Transmission Sidewalls with reinforcement channels to keep it stable through your entire turn regardless of the snow conditions. The 81mm waist is best suited for spending time on the trail, but has the ability to venture off. The Full Rocker Profile locks the RTM 81 into place at the apex of your turns, absorbs negative vibrations from crud, and will help you pivot with ease in variable snow. The Extended Sensorwood Core is one of the most advanced full wood cores providing unshakeable torsional strength. If you like a ski that has a damp feel, will be stable at high speeds and prefers medium to long turns, the RTM 81 will not disappoint. The photos are representative of the skis that you will receive. The ski you will receive will be the same Model, Year, Brand and Graphic and in the same Condition as described below and shown in our photos. This ski was used in a mountain ski shop demo program for two seasons. The tops have heavy scratches and scuff marks. On the topskin there are a lot of chips and slices with some well over 6 in size and length. Some of the chips may be poorly repaired with epoxy by the prior owner. Please see our photos for samples of the numerous and large C size chip. This ski does not look pretty but is still very functional. There is p-tex that was done well. There is a company name and ski length engraved onto the topsheet. It is suppose to take 4-10 days, but about every 4th package seems to take 2-4 weeks. During the holiday season packages can be slowed down even more. Some packages have in the past taken up to 6 weeks to be delivered. This adds the item to your cart so that you can continue shopping. We do not offer 1 day service rates online as most customers find them too expensive. Expedited orders must be in by 6am EST to go out the same day. You can add an item to your shopping cart. Items in your shopping cart are still available to other buyers until they are paid for. You can make an offer, by selecting the Best Offer button. What are your Customer Service Hours? We normally do not work on weekends and holdiays. Please be patient with us on Mondays and after holidays, we will get back to you as quickly as possible. Do you have a store I can shop at? Sorry we have just a warehouse with no retail store or staff to help. You must have a ski shop or mountain shop adjust your bindings. They will need your boots and personal information to adjust and test the bindings. Demo bindings have longer sliding tracks underneath the toe and heel so the bindings can be adjusted to fit many sizes. A regular binding once mounted can only fit one size. What is Boot Sole Length? And Where do I find it on my boot? The boot sole length is a measurement in mm for the length of the plastic sheel of each ski boot. It can usually be found engraved or embossed on the boot above the heel plate on both boots. It is usually found on either the inside or outside of each boot. An example of the number will be 346 or 346mm. Can I return an item? What does the A+, A, B and C mean in the title of your ski? For each ski that enters our warehouse, we rate their topsheet condition as either A+, A, B or C.
A+ skis are our cherry used skis in like new condition. They have the best topsheet of any of our used equipment. 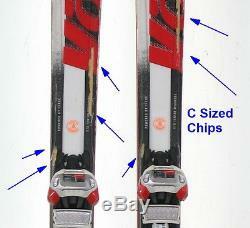 A condition skis will normally have chips up to 1/2 inch in size. B condition skis will normally have chips and/or slices up to 1 in size or length. A+, A and B skis will normally have good edges and bottoms. C condition skis are our worst condition ski. The topsheet will have chips and/or slices over 1 in length. Additionally, there could be edge or base problems with the ski. We always ask our customers to fully read the description for all our skis, but especially the C condition skis. We will always fully disclose any edge or base problems in our description. We are a family run wholesaler of used and closeout ski and snowboard equipment and accessories. We have been involved in the ski business for over 18 years. Customer care is very important to us! We do our best to describe our equipment fairly and honestly and to have clear photos. We inspect every used ski, snowboard and boot we sell. All bases are cleaned and tuned, all base and side edges are cleaned and sharpened. Minor gouges are filled with ptex and cleaned up. Many of our accessory items like poles, goggles, ski bags, socks, etc. Unique template design, marketing, and strategy consulting from As Was. The item "Used 2014 Volkl RTM 81 Expert Ski with Marker RTM Binding 171cm C" is in sale since Monday, July 27, 2015. This item is in the category "Sporting Goods\Winter Sports\Downhill Skiing\Skis". The seller is "snowsportdeals" and is located in Murray, Kentucky. This item can be shipped to United States, to Canada.